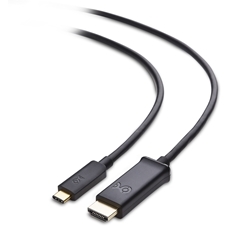 The Cable Matters USB Type-C to HDMI Cable is specifically designed to connect the new release thin computers, smartphones, and tablets to a UHD TV, 4K LED monitor, or projector with HDMI. Stream audio and video from your computer to a 4K Ultra High Definition TV with this convenient cable. Preserve your investment in current displays equipped with HDMI. This adapter provides essential compatibility with next generation smartphones, tablets, and computers equipped with a USB Type C port. Average Customer Reviews: 5/5 Rated by 1 user(s) Click Here to write your review! So far, so good. I ordered through Amazon, got my product quickly, packaging was good, and it was play/play. I am using this to run an HD monitor from a MacBook Pro and the quality is very good with no glitches, thus far (had the product a day). The quality of the cord is also very good. I am going to order another CM product for the 2nd monitor I want to run from my MBP because the current adapter I have is failing (another brand). I'll update if this changes but thumbs up at this point.